This morning, for whatever reason, I pulled it out again. Once I started stewing over it, I realized why it didn’t work for me. It needs, I decided, a touch more complexity. In order to be useful, it needs zones for three-levels of interaction rather than just place markers for the intersections of two and four. 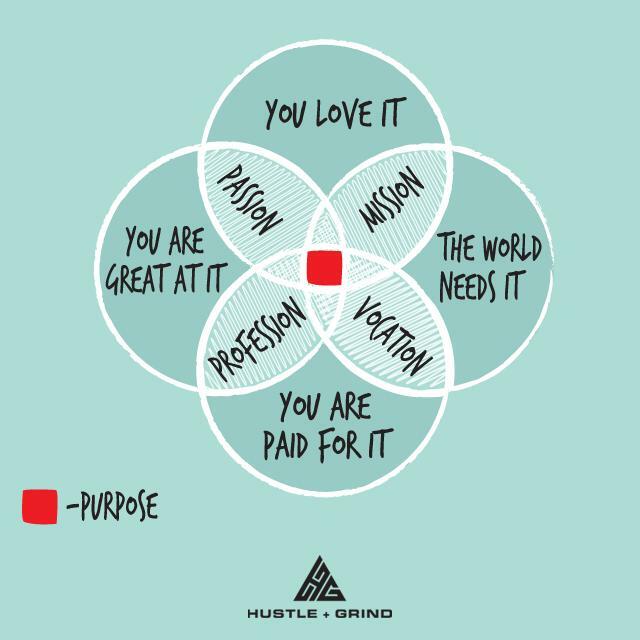 I like this one quite a bit better, not for the least because it shows a bigger sweet spot for “Purpose,” and hence makes such a thing seem perhaps a bit easier to achieve. A purpose, after all, should not be a needle in a haystack for most of us. I also like it because it becomes a better barometer for how to view oneself at the moment, and hence maybe a tool for how to view movement between jobs (or other such stuff) in one’s future. I like the additions of the classification of jobs. I like how it differentiates between a good job, a great job, and a calling. I’ve heard people say they would do something for free that they were getting paid for, and this helps me get my mind around that idea better than the original. I’m not sure why I pulled this out today. Perhaps it’s because yesterday I went back to my old place of work to attend the retirement party of an ex-co-worker. Along the way I spoke to a few folks about their current career situations and listened to how they were viewing their jobs. I liked hearing them. I’ve always liked helping people think about what they wanted to accomplish, after all. That said, I have no idea if that was why I fiddled with this diagram today. All I know is that I did. And I know that after I was done with my doodling, I looked at it and felt pretty good. Perhaps you might find it valuable in your own way. Thanks for sharing! Great alternative version to ours. I like it! Thanks for the note, Ross. Image is updated! I’m a theatre professor and have been using this to help my senior undergraduate students shape their mission statements and career goals. It has been tremendously helpful to both them and me. Thanks to both you and Grind Daily for this tool!!! Thanks, Paulette. This makes me very happy. I am wondering why one needs to be able to make money out of something before it can be your purpose. Lots of people who have a job only to support what they do love in life. Can’t they have a purpose? What about all the people who can’t even hold a job, don’t they have a pupose in life? That’s an interesting and well-made point, Mark. After looking at it a little, I first wondered how this would feel if the “calling” and “purpose” tags were swapped out, but then felt like that wouldn’t solve the disconnect. Another thought came in the form of wondering what this diagram would look like in a world where currency is unnecessary–which may well happen more rapidly than we think. I’m certain I’ll keep thinking about this for some time…so I appreciate your comment. At present, like most rules of thumb, your thought says this diagram breaks down in some critical places.